Please do call us for easy pricing so that we can provide you with the best possible price for your requirements. A large one-piece desk that measures 32" wide to hold 4 pages of music. Height adjustment ranges from 26" to 48" (shelf to floor) with simple lift up/push down mechanism (no knobs, screws, nuts and bolts). This double-shafted Conductor's stand has a wide and extremely stable base. The desk measures 32" wide x 15 1/4" high. With a built-in accessory ledge and storage pocket (behind the desk) the Regal provides optimum functionality for the Conductor. The height adjusts from 24 1/4" to 50 1/4" (shelf to floor) with a maximum overall height of 63 1/4". Unique, double desk construction provides easily accessible music storage. Height adjustment ranges from 26" to 48" (shelf to floor). 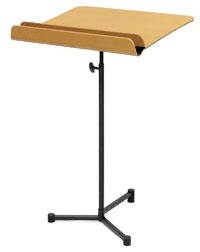 A generously sized Conductor's Stand with a 22" x 26" wide desk with 1.5" ledge. Tripod base makes it easy to tansport. 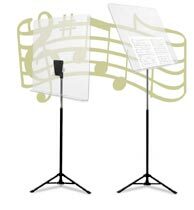 This stand also doubles as an acoustic shield! Price £89.00 plus delivery & VAT. Rugged, lightweight aluminium desks that are ribbed for extra strength. Baked on powder coated finish resists scratches and chipping. Easy automatic friction tilt desk provides constant tension tilt at any position. Original "Magic Finger Clutch" provides one-hand height adjustment and secures at any height, even with a heavy load of music. 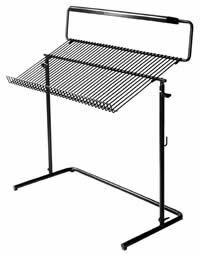 Heavy-gauge, all steel welded base provides excellent stability and requires minimum space on stage risers or in storage. 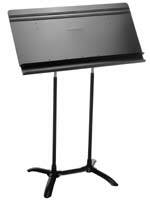 Opera Conductor's Stand is available with or without lights.